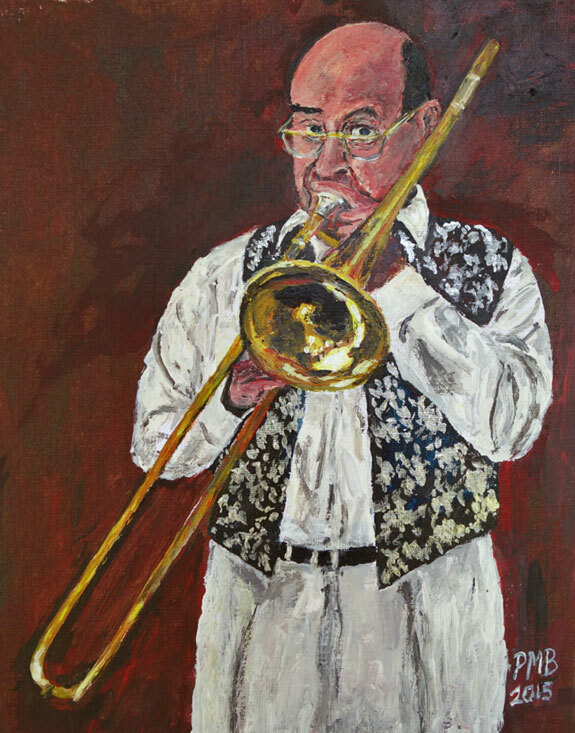 With a waistcoat like that, just how could I resist accepting Tony Cunningham’s commission to paint his portrait on trombone. Thank you for the opportunity Tony and for the wonderful session with Jazz Revisited at Lemsford Jazz Club. 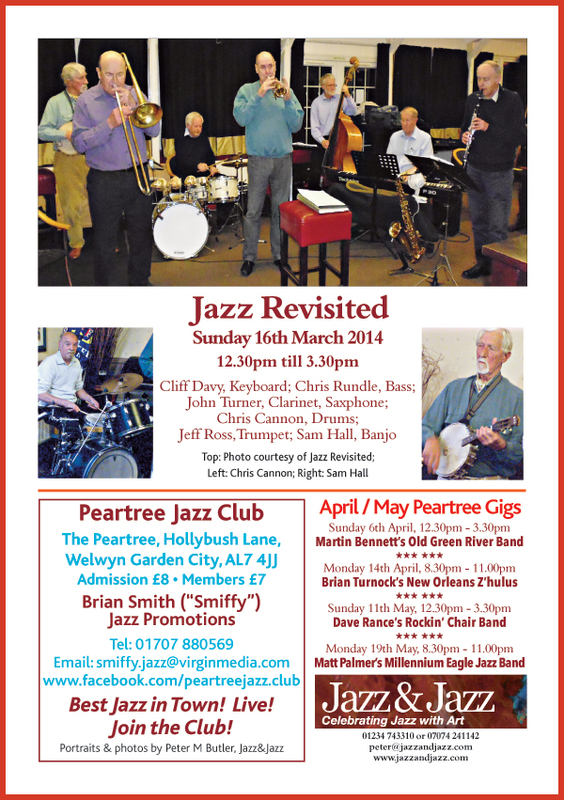 Sam Hall’s “Jazz Revisited” at Lemsford Jazz Club, Hertfordshire. Fine Art Giclée Prints of this portrait are available. to place your order and help support jazz. Filed Under: Jazz Art & YouTubes & "Gripping Yarns"
Sam Hall’s “Jazz Revisited” at Lemsford Jazz Club, Hertfordshire, Sunday, 5th April, 2015. Then in April and May Club gigs alternate between Sundays and Mondays. Full details on the flyer below plus contact information. 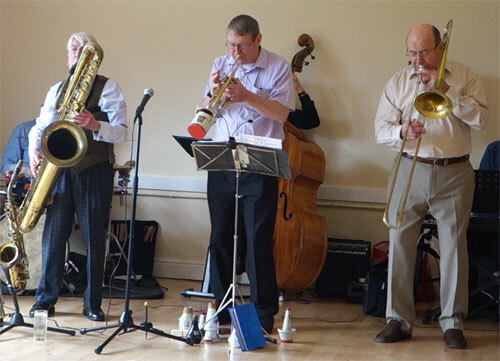 Tony Cunningham, trombone, has recently joined Jazz Revisited. I pen poems for my jazz portraits and personally produce and hand sign my Jazz&Jazz Fine Art Giclée Prints. I happily accept commissions for jazz paintings and jazz portraits from bands and musicians, and especially from fans who might have their favourites. A fine art print of the painting and poem is offered along with each commissioned acrylic jazz painting. To view a selection of portraits completed either for the launch of the Ramsgate Seaside Shuffle Festival in July, 2011, or commissioned during the festivals since, go to Ramsgate Seaside Shuffle Jazz Portraits. JazzandJazz.com is dedicated to promoting jazz and more jazz for Jazz Bands, Jazz Musicians and Jazz Fans. Our aim is to raise the profile of jazz and to develop a sounding board for jazz by inviting bands, musicians and fans to share news and views about the jazz scene. JazzandJazz.com aims to capture, share and promote the unique ethos of jazz by featuring bands, musicians, clubs and festivals. As well as modern day greats, we focus on the vitality of younger, emerging stars and bands, and on the inexhaustible exuberance of smaller bands on the jazz circuit. JazzandJazz.com aims to become a force for jazz by galvanising jazz fans everywhere into a fully fledged jazz revival by getting out and supporting their local clubs and established touring bands. 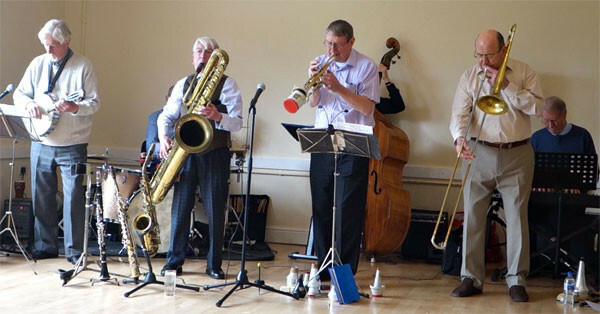 Also by encouraging the newly emerging younger generation of jazz fans to swing along with happy jazz performed by recently launched younger bands and musicians. Fans’ comments on any of the featured items are welcomed. JazzandJazz.com features posts and videos from Jazz&Jazz YouTubes. Launched in 2014 but promoted in earnest only in recent months, as of November 2015, Jazz&Jazz YouTubes includes 300 videos with over 110,000 views increasing daily. Videoed at Clubs, Theatres, Concerts and Festivals and edited by myself to highest iMovie standards they include top musicians and bands with special emphasis on our emerging new generation jazz bands. The videos can be viewed in High Definition. 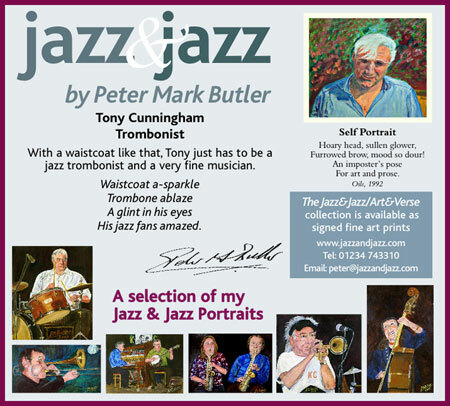 JazzandJazz.com features the Jazz Art of artist and poet, Peter Mark Butler, presenting the dazzling world of jazz through his collection of jazz paintings, jazz portraits and jazz poems. His jazz art reflects his involvement in the jazz scene which prompted him to launch JazzandJazz.com to help champion jazz, raise the profile of New Orleans Revivalist Jazz and keep it alive and thriving. Jazz&Jazz welcomes link exchanges. This can be done by using the simple text link such as http://www.jazzandjazz.com/.